Shield for Arduino designed and based on the module GSM/GPRS SIM900 or the GSM/GPRS & GPS module SIM908, to make calls, voice and data connections via GPRS. This new version (old Arduino GSM shield) has several new hardware features, that allow maximum customization and provide many configurations. 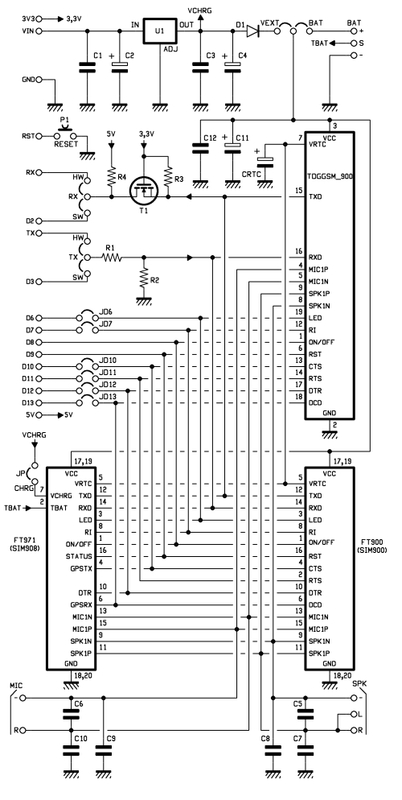 We begin with the supply circuit a simple LM7805. To work, it is necessary to provide an input voltage between 7.5V and 12V. As shown in the circuit diagram, the input voltage, after being stabilized at 5 V, is reduced to 4.3 V by using a diode and provide power to modules that need a voltage between the 3.2 and 4.8 V. During the operations such as the use of GPRS, the module absorbs a current of about 1 A, therefore it is necessary that the power source is able to provide this current intensity. An important technical feature is the serial adapter for the communication between the GSM module and Arduino. To reduce the tension has been used a simple voltage divider, while for raising the voltage from the GSM module to Arduino we chose a MOSFET BS170. The news that is immediately evident is the presence of two jacks for audio. With a microphone and a headset with a 3.5 mm jack (just the standard headphones for computers), you can make a voice call !! To preserve compatibility with the Arduino Mega, we changed the selection method for the serial communication. 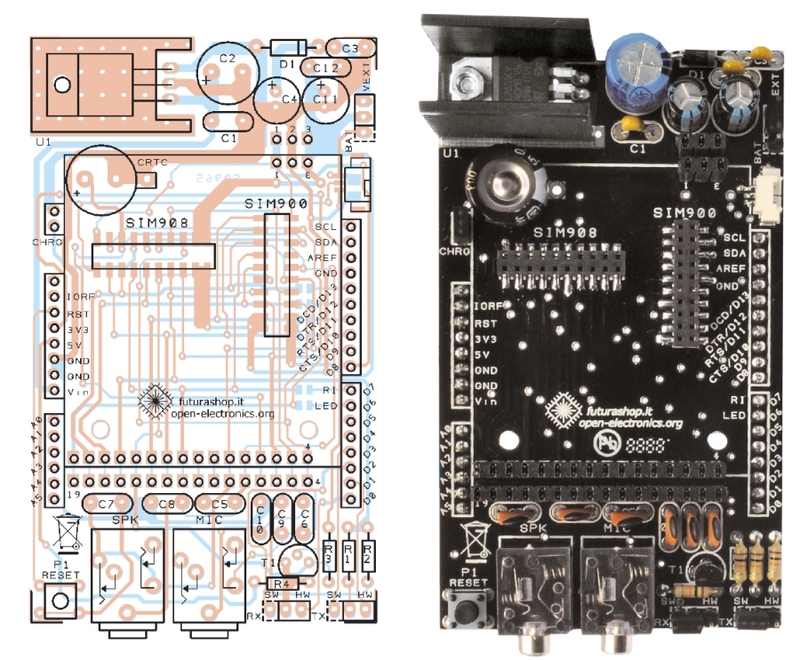 The two different serial communication modes (hardware or software) are selectable by jumper, leaving the user the choice between the two configurations ( for serial software in this new version we adopted pins 2 and 3) or possibly use the pin to your choice with a simple wire connection. With this solution you can use the Arduino Mega using two of the four serial that it has, or possibly carry out the communication through a serial software via two pins of your choice. 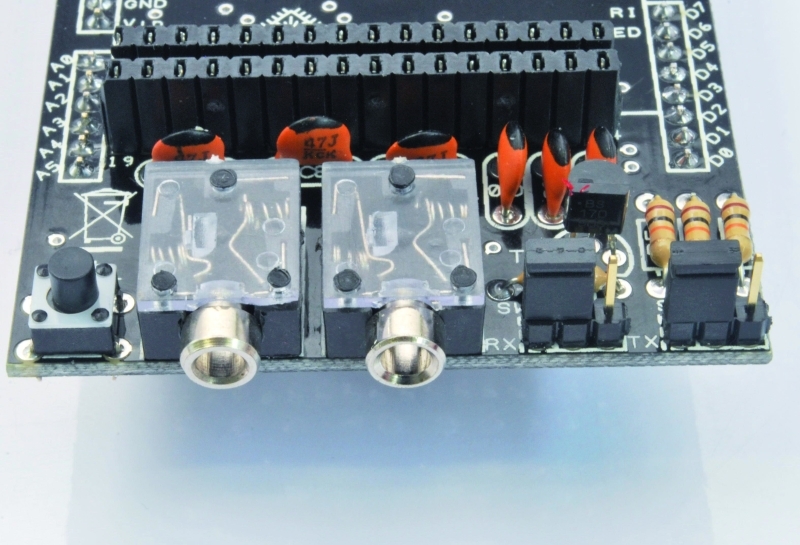 Always to preserve maximum flexibility and customization, there are some pins on the back of PCB, which allow to make the connections from the Arduino digital ports and the control signals data flow (CTS, RTS) or alerts for incoming calls or unread SMS (RI). In this new version, you can then disable these connections to save inputs or outputs pins. Comparing the new card with the previous one, you can see the presence of two connectors on the top.These additional connections allow the use of the shield also with the new small breakout for SIM900 and SIM908. 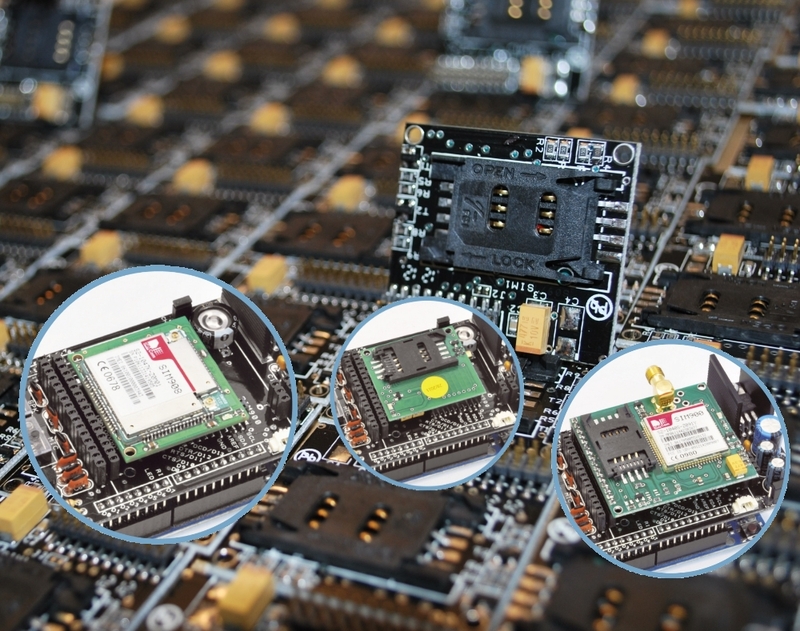 The new module Simcom SIM908, is characterized by the presence of a GPS with 42 channels. 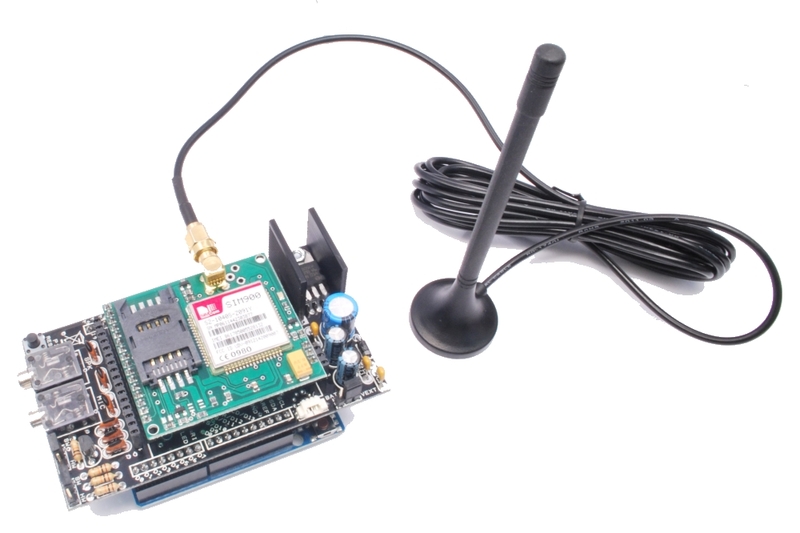 The scenery offered by this new module SIMCOM, in addition to GSM GPRS shield, it is quite remarkable: the creation of a GPS tracking device that can communicate the location via the Internet (or SMS) is now available to everyone, avoiding all the problems due to assembly and low-level programming. A further feature of this new version, concerns the presence of a supercap for circuit dedicated to the RTC (Real Time Clock). Inside the SIM900, as well as the SIM908, there is a circuit that is responsible for updating the clock even without power. The software library related to the GSM GPRS shield has been updated. The library is open-source and uses the hosting service Google Project, located at http://code.google.com/p/gsm-shield-arduino/ . The library is constantly updated and improved with the addition of new features, so please check that you always have the latest release. The main enhancement is the TPC/IP communication support through GPRS. With a simple function, you can connect Arduino to internet using the APN (Access Point Name) you choose. After that we will automatically get an IP address by the provider. To establish communication you must define which device performs the function of the server (still waiting for some connection), such as that client (requires a connection to the server according to the information you want to achieve) and that leads to exchange data . In the library there are two functions that allow us to set the device to listen on a particular port for connections (server), or to establish a connection based on the server address and port chosen (client) . Once connected, you can send the data, which can be command strings or just the data you want to monitor, for this action there is a high-level function, which simplifies the management. First, you must have the folder libraries, in the root directory of the Arduino, the folder GSM_GPRS containing all the functions you can use. Now if you want to change the serial port, through the jumper, you have to modify the file GSM.cpp. To save memory, we decided to divide the functions into different classes contained in different files, to allow you to include or not the code parts needed, thus going to save memory RAM, leaving it free for the rest of the program. For the basic operation is always necessary to include files SIM900.h and SoftwareSerial.h, while depending on the needs you may include call.h (for call handling), sms.h (for sending, receiving and saving SMS) and inetGSM.h (containing functions related to HTTP, and GPRS). You should always include this file. It contains the basic functions for starting and configuring the GSM module. Simply call the functions using “GSM.” As a prefix. Let us now, step by step, our first sketch to use the shield using the Arduino IDE version 1.00. We will write a program that when it receives a call from a preset number (stored in a specific location on the SIM), rejects the call and sends an SMS in response to the caller with the value read from an input. First you have to extract the files from the compressed folder within the Library folder libraries contained within the installation folder of Arduino. Then load, uncomment properly, the files related to classes containing functions that we want to use for the management of phone calls and SMS. We will perform the initialization procedure in the setup. Set the pin to read the value which will then be sent via SMS, configure the serial communication and initialize the module with the function gsm.begin, and set the baud rate (usually for proper communication of data through GPRS is advisable not rise above 4800 baud). At this point we enter the heart of the program, which will periodically check the status of incoming calls. To do this within the cycle loop will use the function call.CallStatusWithAuth saving the byte returned. In the case of incoming or in progress call, the sender (or recipient) number is stored in the string number. Compared with the value stored CALL_INCOM_VOICE_AUTH, which describes an incoming call by a number in that set, we reject the call using the GSM.Hangup and after waiting 2 seconds, read the input value and send the message.The value read is an integer and must be first converted into a string using the function itoa. Let us remember to insert a delay, inside the loop function, to ensure that the module is interrogated at intervals of not less than a second. Commands sent in rapid sequence could corrupt the stability of the module. If we do not receive the result of proper initialization, you will need to check the power supply. Remember that it is recommended to use an external power source because the only power supplied by the USB port is not enought. If the power is found to be correct, you should check that the file GSM.cpp, in the library are declared properly pin for the serial. Basically the new version uses pins 2 and 3, while the old version used pins 4 and 5. We analyze one of the examples contained within the library to connect Arduino to the internet with GPRS connection. We will make a program capable of receiving HTML content from a web page and save the first 50 characters. and as before we execute the initialization routine. Then we establish a GPRS connection. In this step you need to run the command “AT+CIFSR” that requires the provider the IP address assigned to the GSM module. This step is important. Some providers garantee the connection only if previously it’s made this request. Through the function gsm.WhileSimpleRead contained in the GSM class, we read the entire contents of the buffer. Once emptied the buffer, the sketch will go to the following functions. At this point we are connected, we have to establish a TCP connection with the server, send a GET request to a web page and store the contents of the response in a previously declared array. All this is done by the function HttpGet in class inetGSM. In addition to the server and port (80 in the case of HTTP protocol), we have to indicate the path which contains the requested page.For example if you want to download the Wikipedia page on the Arduino to be reached at the following address it.wikipedia.org/wiki/Arduino_(hardware), the path will be /wiki/Arduino_ (hardware) while the server is it.wikipedia.org. Obviously if we wish to save a greater number of characters of the answer, it is sufficient to initialize a string of larger dimensions, taking care not to saturate the RAM is made available by Arduino, otherwise we risk getting abnormal behavior, such as stalls or restarts. The shield has various connectors to accept more GSM/GPRS modules manufactured by SIMCOM and mounted on breakout board. In addition to the popular SIM900, our new shield for Arduino supports the recent SIM908, which is an evolution and aims to capture the market of GSM/GPRS quad-band providing a variety of additional features that make it unique, especially in the field of low-cost products. The SIM908 implements a GPS with 42 channels, characterized by an excellent accuracy and by a very reduced time required to perform the first fix (1 second in mode “hot start” and 30 seconds with the mode “cold start”). This module can be used powered by a lithium battery, and can charge it, greatly simplifying this process that would require dedicated hardware. The SIM908 has two serial, used one for the GSM and the other for the GPS. More exactly, the first serial interface is provided with a UART which belongs to the lines TXD, RXD, DTR, which go outside through the contacts, respectively, 12, 14, 10 of connector; for the GPS, instead, the serial is GPSTXD (contact 4) and GPSRXD (pin 5). The first serial port is actually intended for total control of SIM908, then it can also configure the GPS receiver and ask him to provide data on the location, the number of satellites hooked, etc. From the second serial port (GPSTXD / GPSRXD) instead, go out continuously strings in standard NMEA GPS system. Providing also use the SIM908, the library for the management of this module has been modified to provide a quick access to all the new features made available, the new library is derived from that used for the SIM900 module, and is available on the Internet at http://code.google.com/p/gsm-shield-arduino/ . Note that you can use the new library for managing mobile SIM900, provided you do not call functions dedicated to SIM908. While it is completely compatible using the sketch for the version without GPS with this new one. Let’s consider some new features introduced: first of all has been added the function ForceON(); used to check the status of the module and to force the power on. The SIM908 supports the charge of lithium batteries, the module can be started to perform the charger without the management of the GSM network. If we want to avoid this mode and make sure it’s really turned on then you need to call the function mentioned above. Intended for the use of GPS (and battery), we made a class which you can instantiate an object with GPSGSM gps, after including its # include files “gps.h“, in order to invoke their functions by prefixing “GSM.” to the desired function. This subdivision into different files is designed to minimize RAM usage: in fact, for example, all the variables used by the class on the GPS will not be allocated in memory will not be included if the relevant files using #include “gps.h”.This allows you to choose which variables to use. As already mentioned, also for the management of the battery there ara functions which enable the measurement of the voltage and battery temperature; for practical reasons, occupying little memory, these have been included in the class of GPS. For use them, after including the file #include “gps.h” you must instantiate the object related with GPSGSM gps. In the next sections will show the control functions of the GPS and battery. Before using GPS, you need to make a small set-up: first let’s make a bridge on jumper J1 on the SIM908 Breakout (cod. FT971). The bridge on J1 enables power to the GPS antenna. If you can see the coordinates, it means that everything is working and we can proceed with the standard use by the implemented functions. 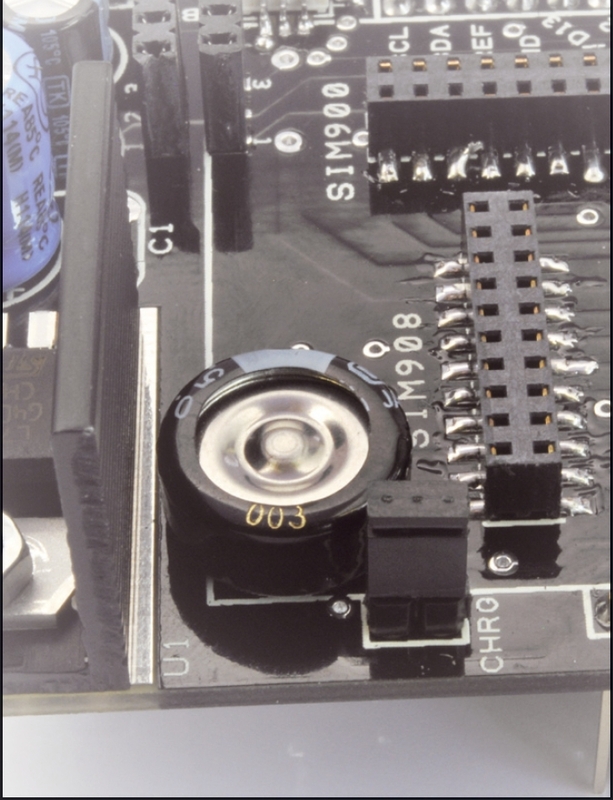 In order to use the lithium battery as the power source for our FT971 module that houses the SIM908 (note: the SIM900 is not able to manage the barrery charge) is sufficient to close the bridge on this shield called with CHRG and set on VEXT the second bridge near the battery connector. Through the two library functions is possible to obtain the percentage of remaining charge, the battery voltage and the voltage read by the temperature sensor. In the case of applications poorly ventilated, with prolonged periods of work and in climatic conditions not exactly optimal, it is advisable to monitor this value to make sure that the battery works within the limits for a correct operation. The temperature can be calculated according to the relationship voltage/temperature sensor. It is also possible to set the module so that automatically determine if the battery is working outside the permissible range, with consequent shutdown of the same. Also in this case we see how to implement these functions in a sketch, referring to this sketch, which contains the corresponding code. Uncomment it, you are going to enable this mode, commenting, no diagnostic message will be shown on the serial output. For problems with the RAM, or simply for projects that require a larger number of input/output, we can use with the GSM/GPRS & GPS shield the Arduino Mega. Thanks to four serial port, we can use one of these instead of the serial software to communicate with the shield. With the latest release, the library can be used completely with Arduino Mega. You must open the file GSM.h and select the tab used appropriately commenting lines of code. Using the file HWSerial.h is not necessary to define the possible use with Arduino Uno, as implemented in the class it is only used by the hardware serial. The library uses the serial Serial0 (TX 1 RX 0) for external communication and the serial Serial1 (RX 18 TX 19) to communicate with SIM900 and SIM908. Nothing prevents you replace every occurrence of Serial1 with Serial2 or one that you prefer. 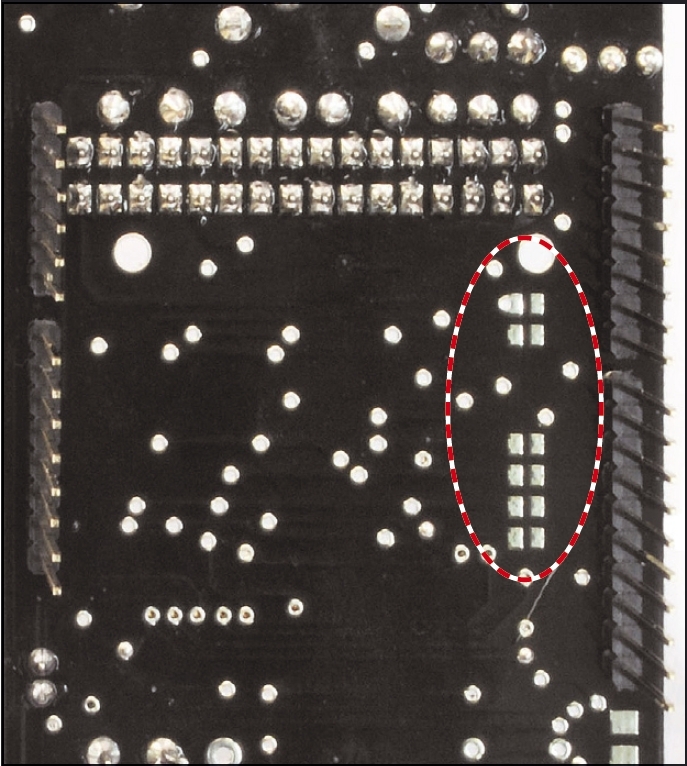 Please note that to use the serial hardware you need to create the connection between the shield and Arduino Mega using a bridge: the TX pin of the shield must be connected to TX1 18 and the RX pin with the RX1 19. I’m sorry, this may be a stupid question. Do you need a specific network to use this? Does it work automatically? This is a GSM/GPRS shield with also GPS (usign SIM908). It works on all network. The presence of two jacks for audio (microphone and a headset) to make voice call is an intelligent idea! Pingback: Jak zbudować telefon komórkowy ? Hi, because the 7805 in the shield is used also to charge the battery (with SIM908). The power regulator on Arduino is too small. is the sim900 or sim908 module included in the shield? thanks! Simple question: now that Arduino Due is out, will this work with the Arduino Due? Good question, will test ASAP Arduino team send as a sample of the DUE. Trying to use this with an AT&T sim card and send an SMS to a USA phone number. Im use the sms.SendSMS command as in the library example and it comes back that it has been sent but I never receive it on my phone. Im using +1 then the 10 digit US number. You could sniff the serial comunication to understand where is the problem. my pal. try without mentioning the country code. It works well for me. have you tried it?? shielded cable?? shielded cable to connect the wtv020 ‘s output? what if i am connecting it with a PCB track? I have no idea of shielded cables! this is the part of board. Someone should redo the board layout so it would fit in the arduino box or even at the bottom correctly. Still nice to experiment with this one. It makes no changes when i change the Pins in the GSM.cpp. with arduino uno… I think the problem on this is the “8170-CAVOUFLSMA (Adapter antenna cable UFL-SMA).”…. It should not be like this the design when it attached to the ” SIM908″…. Got some parts of this working but with a bit of trial and errors. Firstly I did redo the httpget to send data out. It works. But I’m unable to catch the http session receive from the httpget. Is it somewhere in the GSM::WaitResp function, the first occurrence but I cannot locate the at command to catch the reply.. or maybe being blind..
hi. how to open the gsm shield programmatically without pressing the power button. Is it compatible with Arduino Leonardo? The “Adapter antenna cable U.FL-SMA” has a lose connection when it is interfacing to the connection of it in “7100-FT971M (Breakout with SIM908)”… The cable that I ordered has a big error because it cannot be attached formally or make a connection properly to the “7100-FT971M (Breakout with SIM908)”…. Please make some response on this matter.. This cable http://store.open-electronics.org/Accessories/Antennas/Adapter%20antenna%20cable%20UFL-SMA is for FT971. So I don’t understand the problem. Is it a damaged cable? can u give me another connector on it???? it is totally damaged…. 8170-CAVOUFLSMA (Adapter antenna cable UFL-SMA)…. will this work with arduino duemilanove???? actually i try run some of the sample code and that is the result…. please help me to understand it better… any convertion to make this understandable??? you can use the returns module. why is it Sir Boris until now I did’nt receive a reply to the “return module ADMIN”???? Can you provide the PCB details of both the breakout and shield? May be gerber files? Will be great to have the PCB and Gerber files. why is it that so hard to get GPS data??? I made more trials to get it directly the information of GPS… but it is really hard to me…. The GPS need to see the sky. I’m sorry for being spamming Sir Boris… I will not do that again…. Thank you very much for the response…. I already make it… The GPS see the sky but nothing is changed… zero coordinates given… I made many trials but no coordinates…. Where is this datasheet ? be gratefull for an answer. Can i send data from this shield/arduino trought get method to a specific sql table? Hi, you can send data with GET method. I bought the shield with the SIM908 module. I am using arduino mega, so i conected the tx and rx pins as you said above. When i want to run the basic SMS code from you library i get an error back on the serial monitor and it says the module STATUS=IDLE. Am i supposed to conect the RX on the shiel to the RX119 on the arduino and the TX on the shield to the TX118, or maybe to conect the RXs with the TXs? As i can see, the modul doesnt respond, could give me some ideas what can cause it? 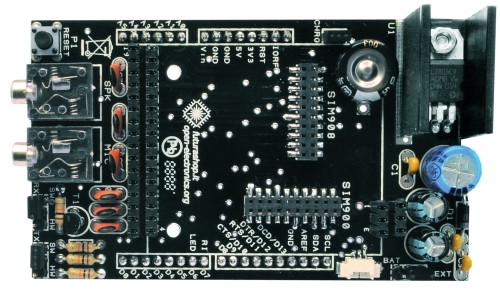 You can test the module with the serial2 hardware or with software pins. What are you using? So, im not sure where should i physically find the TX and RX pin on the shield? I bought the shield with the SIM908 module but I can not get it work. 1.- Do I have to do anything to work with HW Serial besides jumper configuration? 2.- Is the GSM GPS SHIELD SCHEMATICS the last version? I have seen some differences in my shield while testing my soldering. I suggest you to use the SFW serial comunication. The library by default works with this configuration. Great! It works now! Thanks!! How can I use the HW Serial instead of SW Serial? And is the schematic the last version? I think it doesn’t fit 100% with my shield. To use the HW serial you have to change all “myserial” with serial. Please, could you tell me the battery connector type? I think it’s JST SH type but I’m not sure. ERROR: SIM900 doesn’t answer. Check power and serial pins in GSM.cpp. I tried downloading the latest source code, but that does not seem to be possible due to a mishap in the svn directory. Checking out svn checkout http://gsm-shield-arduino.googlecode.com/svn/trunk/ gsm-shield-arduino-read-only results in a few files and an email address. I had to checkout http://gsm-shield-arduino.googlecode.com/svn/branches/GSMSHIELD to get the latest. What else can I do to get the SIM908 breakout to work with the shield? OK, found the culprit. Arduino Leonardo and this shield is a no-go. Arduino Uno Rev3 (Not Rev2 or 1) will work. The GPS antenna also really needs a free view. are you using the right pins? Hi everybody, i have a leonardo board and this shield with SIM908. Please help me, i really don’t get what the problem is. I am considering this shield for use in an application in which I need it to send and receive Data SMS to and from an Android phone. For the Android phone part, I already know how to send and receive Data SMS. I am wondering if it will be possible for this shield to send/receive Data SMS since I don’t see any related function in the library. Can you please kindly advise? Hi, I can’t get this to work. I get errors at random times. LED on mini gsm board flashed, using sw serial on UNO R3. Got it working if I press down on simcard and chip. Then i can restart and it will connect, but when I turn of power I need to press down again. If I don’t do it, the led will flash a couple of times before turning of. Tried to connect a gps with Tinygps on softwareserial, but I cant get any info from the GPS if I try to connect gsm in setup. Got 250 bytes of free memory, so that should not be the problem. So probably there are some wrong solder. Yes, its a bad solder on the mini gsm board. Does any of the beta lib offer less ram usage? What about the softSerial problem, Is it not possible to use your gsm lib with another connection to softserial? Dear, I received this shield, with SIM908 breakout. Everything works fine, but when you start the GPS, the errors are very common. When querying the status of the GPS module with CGPSSTATUS just get: “Location Unknown” and takes a long time to fix the GPS to 2D / 3D FIX. The shield also came with an active antenna, with U.FL connector, which I understand is 3~5v, however, in the wiring diagram provided in the manuals of the shield and breakout SIM908, I see no connection at pins 56 GPS_VCC_RF (2.8v), or 58 GPS_VANT to provide power to the antenna. In fact, in the wiring diagram, the pinout differs from the pin numbers of the SIM908. Can you send me the wiring diagram of SIM908 breakout? I’ve looked at the site, but I have not been able to find. Thank you! there are any way to have the time on the sim900 module (hour,mim,seg-day,month,year) and I can read from my arduino uno board through the serial port? please tell me can i use SIM908 without External battery….. if not please tell me the Maximum voltage and Amp value???? –>the pin 1 on the arduino uno board is Rx but in this skecth is digital,Why? –>from pin 1 of arduino uno where pin I need to connect in the GSM board? Could you tell me where I should change the time duration of the call ( void Call(int sim_position) ? How many and which pins I will need to connect it to the Arduino Uno ? The shield uses only 4 pins, the other pin are optional. I used the shield with UNO, but can’t make it work with MEGA. Pls. help! If you want use the Shield with mega, you need to wiring the Serial1 to the shield pin. For UNO no problem because there are the jumpers. other SIM cards I also have. But I don’t receive any text messages. I am unable to get GPS signals. At gps.getStat(); I get stat=0. (GPS off). Please help. The jumper is closed ok. The breakout has been working for quite some time, but suddenly stopped. What can cause this? For such an expensive breakout it must work perfectly. GSM is working as expected. We sell a lot of products with this breakout board. Do you use it with the shield? Yes, it is used with your shield. Yes, I use it with a shield, but still only Getstat==0. GPS = off. Please help. can you use the gps functions with sim900? if I want to buy 100 sim908 modules you can sell me ? Will this library works with Arduino UNO..
Hi. How do i power BOTH the arduino and this shield using only ONE single battery? whether a camera can be interfaced with it???? Hi,I am trying to get GPS data using SIM 908 with Arduino mega,but i failed to get the data,do i need to apply voltage in GPS_VANT, what should i do with GPS TX and RX pin, i connected TXD and RXD of SIM 908 to pin 2,3 of arduino mega with DTR pulled down and applied 4 volts in V_BAT, using the library fuctions provided here,i got “NO RESP” in the serial monitor,can u help me out?? when i tried to set up the GPS and typed the command in the serial monitor the monitor responded an error when i typed in: “AT+CGSPRST=0” The GPS is not working. What can i do? Jumper is connected… sms is working. but I can not get it work. Please, can you help me?????? for GPRS if i connect using inet.attachGPRS() then it always show error. MY APN is correct and there is no username and password. I am able to use the same SIM withy other module and it is working fien but with my new module it’s not working. This shield works with arduino DUE, YES or NO?.. hi, where can i get this in dubai? can anyone help or know what i need to do to get this shield working. Hi there! I’m trying to use the shield below with an arduino mega. I’ve read I need to bridge the tx and rx pins of the shield to pins 18 and 19 og mega. But I don´t know where to find them. Can anyone help me, please?? Does the “GSM GPS Shield for Arduino” have the same functionality as the “Localizer with SIM908 module” with the PIC18LF6722? 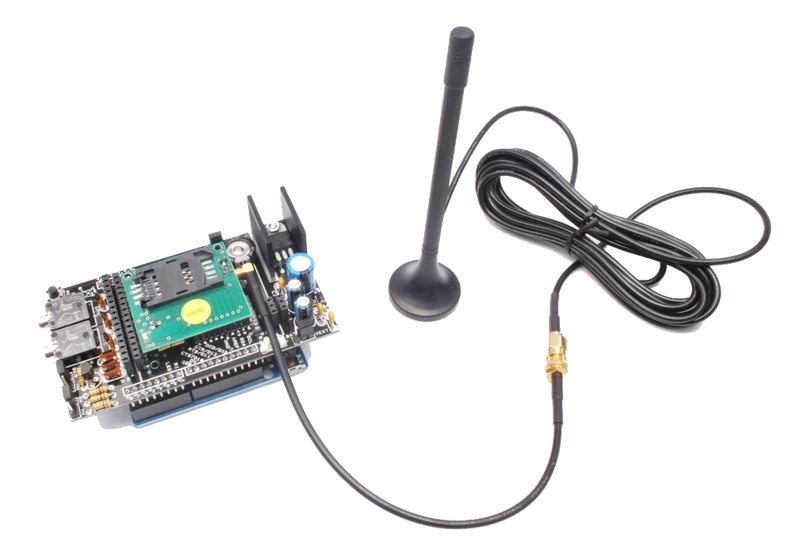 I wish to use the GSM GPS Shield for Arduino and send position data to my server via GPRS with the Arduino shield connected as a client. The ability to configure the “Localizer with SIM908 module” via SMS messages is awesome and I would like this functionality in the Arduino shield. Hello David, i just want to ask have you solve this problem? because i got the same problem as you. You can see more projects here. I have tried to gather all my collection of websites and youtube channels and videos in one place. There are many things also to introduce to you in an elegant way so I established this site : http://www.speakelectronics.com and I hope you like it. I have the SIM908 breakout. GSM works ok, but the GPS does not. It returns GPS OFF when running the GPS-example above. It worked ok for some time, but then stopped. I have bought a new breakout and Arduino board. Nothing changed. I have not changed the shield though. I also have 12 V supply. I do not like the “GPS OFF” because this is the status of the GPS. Please help. This is an expencive product and should work accordingly. Pls give me the exact procedure, as I am new to this. I have done several attempts to resolve this and read GPS-data with no success. The latest test, I also used AT-commands. This means I guess that the GPS-module is not responding at all. PLEASE HELP! I want to control system through map, using gps and gsm. As far as I know GSM is for controlling and gps is for mapping. Could you give me an example smallest circuit in which both gps and gsm are collected together, that I want both map tracking(by gps) and controll(by gsm). I would appreciate your answers, I don’t know whether my idea is correct for this purpose. I want to use this shield to process DTMF tones. I want to make a call to this GSM shield. Can anyone please tell me how to receive the calls using this shield? Hi, Is it possible to provide the design files for this? schematic/layout/BOM. En Caso de Jammer Como podria transmitir La Señal GPS? En caso de Jammer, como transmito la señal del gps? But the result is a mixture of the actual data with rare values (sometimes there is a ‘w’, sometimes a ‘#’).